Our Aged Parchment Paper is our best seller and gives optimal type visibility while exuding old world charm. The Aged Parchment Paper is ideal for use as certificate paper, presentations, poetry, menus, and much more. We offer 8.5x11, 8.5x14, 11x14, 11x17, 12x18, 13x19, A3, A4, and A5 sizes. Our parchment paper is offered in a 32-lb. weight for luxurious thickness and increased durability. This paper replicates the appearance of ancient, historical paper to convey antiquity and importance to the viewer. The modern manufacturing technique mimics the looks of the original animal-skin paper. 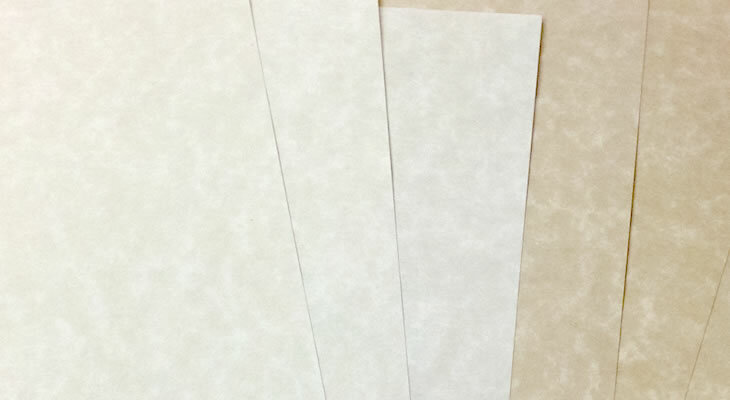 Applications: Parchment paper is used for menus, certificates, awards, and other important documents. Ideal for calligraphy writing or to enhance the presentation of framed documents such as genealogy charts and poetry. Aged parchment paper strives to duplicate traditional parchment’s aged look while providing a practical, and useable product in today’s home and office environments. Parchment paper is highly suited for formal use, lending an air of distinction to any printed document. It looks especially elegant when framed. To maintain the historic theme, use an old-world style font that calls to mind the gorgeous calligraphy of classic illuminated manuscripts. For a more down-to-earth application, look for fonts that resemble script handwriting. Examples of fonts that pair well with parchment paper include Olde English, Edwardian Script, Bookman Old Style, Birds of Paradise, Chopin Script, Jellyka Saint Andrew’s Queen, and Zapf Chancery.